Florida is filled with hundreds of golf resorts, stunning beaches, an incredible and diverse food scene, and tons of things to see & do. Planning a golf trip to the stunning state could lead to stress quite easily with all of the options. Let us help! The first step in planning your Florida golf getaway is to figure out which part of Florida matches your style of play. And don’t forget to think about other activities you want to do. For instance, if you want your pick of beach activities when not on the course, then you may want to look at West Palm Beach or Naples. If you want to sneak in a few rounds on a Disney vacation, consider Orlando. We have hotel options and golf packages for both! Check out a full list of our 3-day/2-round golf packages here: Florida Golf Packages (and keep in mind that these are completely customizable!). West Palm Beach is truly a one-stop-shop for a fun and exciting vacation of any type, but it is absolutely perfect for a golf trip. This area in Florida is full of sunny, palm-lined streets, picturesque ocean views, historic neighborhoods, huge shopping districts, and a fun, year-round outdoor festival scene. 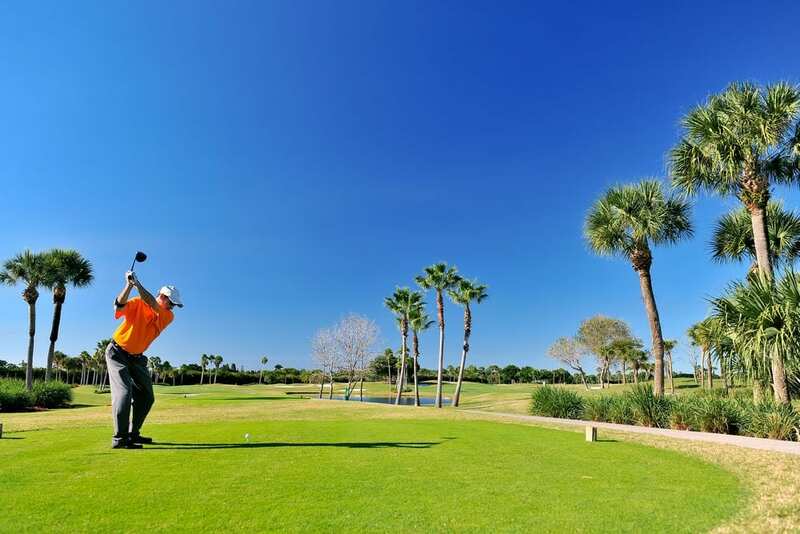 The area is home to several stunning golf courses, including the PGA Golf Club, The Country Club Course at Boca Raton Resort and Club, and The Breakers Rees Jones Course. This 4-star, all-villa resort has not one, but three challenging golf course. Located in the heart of Florida’s Treasure Coast, it has easy access to the area’s unspoiled beaches. When you aren’t playing golf or catching the sunset at the beach, enjoy fishing on St. Lucie River or soaking in the whirlpool with a glass of wine. The Breakers is a classic West Palm Beach resort, known as a paradise for couples, families, and special gatherings. It was built more than 100 years ago, and offers the elegance of a grand and legendary hotel, but the energy of a youthful, family resort. The service is unbeatable, the grounds are meticulous and grand, and this extends to The Breakers golf course onsite. Naples is a hub for fine dining, boutique shopping, glamorous resorts, sandy beaches and golf courses. With average temps in the high 70s from December through February, Naples keeps golfers swinging from Thanksgiving until Easter. The 4.5-star La Playa Beach and Golf Resort boasts spacious accommodations and luxurious amenities. In addition, you’ll find sweeping views from a large private balcony. Try your swing at the new Bob-Cupp-designed golf course, then enjoy a gourmet meal and sunset at the upscale restaurant. Located on the grounds of the Tiburon Golf Club, the 5-star Ritz-Carlton Golf Resort is a full-service hotel combining Old World charm with a tropical Florida atmosphere. The fine dining and upscale shops of Naples are ten miles south, and the beaches of the Gulf Coast are within three miles. In addition, guests of the Ritz-Carlton Golf Resort enjoy complimentary transportation and full use of facilities at The Ritz-Carlton Naples Beach Resort. At the 4-star Hyatt Regency Coconut Point Resort, you will find a true tropical paradise. Activities and options are endless. You’ll find several pools and waterslides, a full-service spa, as well as the award-winning Raptor Bay golf course. You’ll also find paddle boating through the mangroves, water taxi rides across the Gulf, and a secluded stretch of beach. Although it’s best known for its theme parks, Orlando is also home to some of the world’s best golf. We love Orlando for its excess of activities and dining options, plus its full-service golf resorts. The 4.5-star Omni Orlando is a golf-lovers paradise. The hotel is surrounded by 36 holes of championship golf, and 15 acres of recreation space. In addition you will find the Leadbetter Golf Academy World Headquarters. Choose from luxurious guest rooms and suites, or luxurious two- and three-bedroom villas. Beyond golf, relax in the full-service spa, dine in one of the seven restaurants, or cool down in the lazy river. Located just a hop, skip, & jump away from Walt Disney World Theme Parks, Waldorf Astoria Orlando is an elegant oasis of modern luxury set inside a peaceful 482-acre nature preserve. Enjoy a round of golf at the Rees Jones-designed Golf Club, or an afternoon at the Waldorf Astoria Spa. Guests of Waldorf Astoria Orlando may enjoy the facilities and amenities of the adjacent Hilton Orlando Bonnet Creek. This includes their award-winning 3-acre lazy river pool with water slides. To book your own golf getaway, call us at 402-281-3022!